Clashes between protesters and police began on Nov. 30 as incumbent President Juan Orlando Hernandez emerged with a growing lead, following a reported computer glitch that shut down the vote counting for several hours. Both the National Party incumbent and his rival, television personality Salvador Nasralla, representing the Alliance Against the Dictatorship, have claimed victory in the Nov. 26 election. Deadly protests erupted after a delayed vote count in a hotly disputed presidential election. The Central American province of the Society of Jesus commented on the unrest, criticizing the nation’s electoral agency and offering its support to street protesters. In a communique released on Dec. 3, the Jesuits denounced “the lack of professionalism and ethics of the Supreme Electoral Tribunal” because of its systematic failure to track and report the election results. “It is no longer just a suspicion, but a certainty,” the Jesuits wrote, referring to “the crude manipulation of this situation by the magistrates, influenced by the real and shadowy power from the state and other places in an attempt to disregard the popular will expressed in the polls. The Jesuit provincial leadership also denounced “the repression of the Honduran people by agents of the state,” adding, “the people again teach us a lesson about civic duty, dignity and the peaceful defense of the rights of citizens.” The statement was signed by P. Rolando Alvarado López, S.J., provincial of the Central American Province; and Francisco Iznardo Almiñana, S.J., the coordinator of the province’s social apostolate. Fifty-eight percent of the votes had been counted on Nov. 26 when the election tribunal—controlled by Mr. Hernandez’s allies—halted the count and released no information for more than a day. When the count began again it showed Mr. Hernandez quickly closing the gap and overtaking Mr. Nasralla. The tribunal then delayed declaring a winner on Nov. 29 due to a computer crash, fueling further suspicions. Salvador Nasralla has alleged fraud and said he will not respect the official results. Mr. Nasralla watched his unexpected 5-point advantage vanish as official results trickled out. He has alleged fraud and said he will not respect the official results. Mr. Hernandez held on to a lead of about 52,000 votes as the long-delayed count wrapped up on Dec. 4—giving him 43 percent to Mr. Nasralla’s 41.4 percent, according to the latest results published on the electoral tribunal’s website. On Dec. 1, Mr. Nasralla called for the vote to be held again after street clashes between protesters and troops continued and the government imposed a dawn-to-dusk curfew. Clashes between protesters and troops are blamed for the death of at least one person and as many as six. “I have asked them to repeat the elections, but only those for the presidency, with the aim of resolving the crisis that Honduras is suffering,” Mr. Nasralla told The Associated Press. But he said the new election should be “under the supervision of an international electoral tribunal, not the local one because there aren’t sufficient conditions to guarantee” the vote would be fair. Mr. Nasralla said the government had not responded to his proposal. “And I don’t think they will,” he added. Opposition-party supporters protested with bonfires and roadblocks across the country over the weekend. Hooded demonstrators threw rocks and pieces of wood at riot police carrying batons and shields. They responded forcefully with tear gas and water cannons as calls to maintain calm went unheeded. At least four people were admitted to the University School Hospital, in Tegucigalpa, with injuries to the head and neck. Red Cross workers also attended to people in the streets, including one young protester bleeding profusely from the head. In the northern municipality of Santa Rita, police reported that two officers and a member of the military were injured by protesters. Caritas de Honduras, the social service arm of the Honduran Church, scolded all parties for calling their supporters into the streets. “That situation every day makes integration of society and the recovery of governability more distant,” it said in a statement. The Jesuit leaders, however, supported protesters. 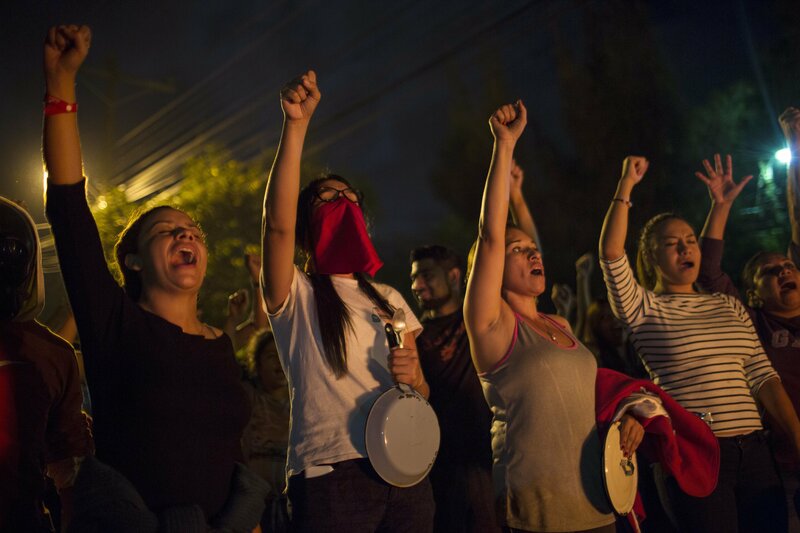 “We stand in solidarity with the peaceful defense of democracy and the rights that the Honduran people are upholding across the country,” they said.